Bruce Krasting — Mortgage relief in the works? Go back a week to an article in the NY Times (Link). The guts of this story is that the Administration is working on a plan to Re-Fi residential mortgages on a massive scale. This could be big if true. It's long overdue, and it should have been done when so many people were asking why Wall Street got loans and not Main Street. Until the housing market clears out, the recovery won't get legs. ...Each day it becomes more apparent that we are on a misguided mission. Pursuit of perpetual economic growth is not a winning proposition for a lasting prosperity. Building a bigger economy can make sense in some circumstances, but always aiming to build a bigger economy means taking an ever-bigger chunk out of the earth’s ecosystems and the life-support services they provide. Why, then, do so many people believe in the fantasy of infinite growth on a finite planet? Is it because we can’t come up with a better idea? Is it because the rich and powerful have trapped the rest of us in their web of conspiracy? Is it because people are hopelessly greedy and materialistic? At various times and places we might answer these questions affirmatively, but we can more commonly answer, “No, no, and no.” Putting aside conspiracy theories for the moment, there are three honest (but bogus) reasons why we pursue economic growth past the point of effectiveness and reason. Why Do So Many People Believe in the Fantasy of Infinite Growth on a Finite Planet? by Rob Dietz at The Daly News: Steady State Commentary and Related News. The same first chapter [of The Coming Chaos] also illustrates why a voluntary reduction in population cannot work. (For that matter, neither would a mandatory reduction in population, and for the same reason.) Again, it's simple arithmetic. Oil production will fall, over the next few decades, by about 3 percent annually, and if instead we say 2 percent or 4 percent the final result isn't much different. But even if every woman on earth stopped having children from this day forward, there would still not be a 3 or 2 or 4 percent annual reduction in population. But if anyone really needs a magic number, a good choice would be 2030. That's the date at which, with a 3 percent annual decline in oil production, the year's production will be half of that in the peak year. And half of peak oil means half of everything else in human society. A very important “half” will be population, because the other half will have died of famine. And that's the one item that very few people can mentally assimilate. A Time Frame For Systemic Collapse by Peter Goodchild at CounterCurrents. Gaining an illustrative picture of a subject is very much a matter of habit. When considering the consequences of peak oil, no everyday experiences and only few historical parallels are at hand. It is therefore difficult to imagine how significant the effects of being gradually deprived of one of our civilisation’s most important energy sources will be. Psychological barriers cause indisputable facts to be blanked out and lead to almost instinctively refusing to look into this difficult subject in detail. Peak oil, however, is unavoidable (p. 91). Is the world headed off a Seneca cliff? It would be some consolation for the feebleness of our selves and our works if all things should perish as slowly as they come into being; but as it is, increases are of sluggish growth, but the way to ruin is rapid. Bardi presents a fairly simple model suggesting that this is the case with respect to petro-energy as the driver of the world economy. If you are into energy economics, it's a good read. The depth of the contraction and the weakness of the recovery are both result and cause of the ongoing economic fragility. They are a result, because excessive private sector debt interacts with weak asset prices, particularly of housing, to depress demand. They are a cause, because the weaker is the expected growth in demand, the smaller is the desire of companies to invest and the more subdued is the impulse to lend. This, then, is an economy that fails to achieve “escape velocity” and so is in danger of falling back to earth. Martin Wolf, Struggling with a great contraction at The Financial Times. Nothing most readers here don't already know, since Wolf's analysis is quite similar that of MMT economists. But it is nice seeing something like this at FT. Martin Wolf seems to be one of the very few sane economists in an insane world. The Navy has always led when we’ve changed energy. In the 1850’s, we went from sail to coal. In the early part of the 20th century, we went from coal to oil. We pioneered the use of nuclear for transportation in the 1950’s. Every single time we did these things there were people who said ‘it’s a fad.’ There were people who said ‘you’re trading one very known source of propulsion or energy for something that’s unsure – too expensive or just won’t work.’ And every single time they were wrong. Every single time. And I am absolutely confident those folks are going to be wrong this time too. Dean Baker's latest book, The End of Loser Liberalism: Making Markets Progressive, is available as a free download in PDF here at The Center for Economic and Policy Research. Progressives need a fundamentally new approach to politics. They have been losing not just because conservatives have so much more money and power, but also because they have accepted the conservatives’ framing of political debates. They have accepted a framing where conservatives want market outcomes whereas liberals want the government to intervene to bring about outcomes that they consider fair. This is not true. Conservatives rely on the government all the time, most importantly in structuring the market in ways that ensure that income flows upwards. The framing that conservatives like the market while liberals like the government puts liberals in the position of seeming to want to tax the winners to help the losers. This "loser liberalism" is bad policy and horrible politics. Progressives would be better off fighting battles over the structure of markets so that they don't redistribute income upward. This book describes some of the key areas where progressives can focus their efforts in restructuring market so that more income flows to the bulk of the working population rather than just a small elite. Economist, Strategy Department of the Division of Supervisory policy, Dutch Central Bank at VOX EU. "Another issue is whether the Social Security tax is really a tax at all (Ed: Whaaaaat?). A case can be made that it is really part of a worker’s compensation (Ed: oh...okay...), rather than a reduction of it – because the workers generally get back all of their contributions, plus more, in the form of Social Security benefits in retirement." Let's follow this logic then: It's okay to take out FICA now because we're going to "get it back" decades from now so that should make us feel better and go out and spend money we don't have today? Am I missing something? This from Bartlett on top of the proposal out of Yale's Shiller that Mike posted earlier today is now strike 2 for today.... all we need now is Krugman to chime in this evening with another losing proposal and it will be 3 strikes, 'you're out' for the out of paradigm crowd today..... one tough day! Bizarro economics courtesy of Yale: The "balanced budget stimulus." This ranks right up there with "contractionary expansion." Yale professor Robert Shiller, talks about how we can solve our economic problems by raising taxes then spending that revenue. "In reality, stimulus can easily take a balanced budget form: The government can simply raise taxes and raise expenditures by the same amount." Ummm...isn't that just redistribution of income? Net change is zero? Okay, maybe it could work by recycling the savings of the wealthy (presumably, they are the ones who'd be taxed) into greater levels of consumption. But call it what it is...income redistribution. The problem is, no new net financial assets are created and that's what the non-government is desiring to accumulate right now. It's why interest rates are so low and why demand for Treasuries is so high. Deficit spending facilitated by higher public debt issuance does the same thing only better. It recycles savings into higher consumption AND creates net new financial assets. All of MMT had this right because MMT allows you to understand that the central bank sets rates and that the funds used to buy government securities comes from government spending itself. It's bad enough that Bill Gross got it wrong, but he embarrassed himself by Tweeting, "Who will buy them now?" when the Fed ended QE2 on June 30. For a currency issuing nation there is never lack of funds or a lack of buyers for public debt issued in its own currency, by definition. He still thinks that the market sets rates. The calls for better bank regulation are many. This column argues that regulators have the concepts right, but the mechanisms are in need of repair. Charles A. E. Goodhart, If banks should act as utilities, why not treat them as such?, at VOX EU. Goodhart's chief point is that to accomplish its purpose, bank regulation needs to be designed in a way that gives regulators an early enough indicator for timely intervention, before the situation has deteriorated to the point at which a fiduciary institution with characteristics of a public utility is insolvent or nearly so. The concept of an economics of happiness rather than an economics of growth is picking up steam as Jeff Sachs throws his weight behind it. It's a short post and cuts to the chase. The mad pursuit of corporate profits is threatening us all. To be sure, we should support economic growth and development, but only in a broader context: one that promotes environmental sustainability and the values of compassion and honesty that are required for social trust. The search for happiness should not be confined to the beautiful mountain kingdom of Bhutan. Read it all at Project Syndicate, The Economics of Happiness. UPDATE: Tyler over at Zero Hedge agrees, How The Economy Quietly Entered A Recession On Friday, And Why The GDP Predicts A Sub-Zero Nonfarm Payroll Number. Philip Pilkington interviews David Gaeber, economic anthropologist and author of the recently published, Debt: The First 5,000 Years (Melville House, 2011). This is one of the best pieces I have encountered on the history of money. It is a must-read, IMHO, especially for anyone interested in MMT and the basis for its Chartalist theory of money. Gaeber also participates extensively in the comments. Kudos to Yves Smith of Naked Capitalism for hosting it. John Emerson posted Attendant Lords, which examines the "professionalization" of philosophy and also of economics. He finds that just as analytic philosophy has come to dominate US academia, commandeering the professional universe of discourse, so too have "the modelers" in economics. The result is that both disciplines have become alienated from their roots and isolated from reality in their pursuit of rigor and analytic "purity." More ominously, the result is a dogmatism that is reminiscent of the religious dogma and hierarchical dominance from which free thinkers and scientists struggled to liberate themselves in the past. Interestingly, David Graeber lost his position at Yale apparently as a result of this syndrome. Not for everyone, maybe, but for those interested in the state of intellectual debate in these disciplines, this is for you. I comment on my experience, and Emerson responds. Michael Pettis is somewhat pessimistic and foresees continued stagnation and deflationary tendencies in his crystal ball. • BRICS and other developing countries have not decoupled in any meaningful sense, and once the current liquidity-driven investment boom subsides the developing world will be hit hard by the global crisis. • Over the next two years Chinese household consumption will continue declining as a share of GDP. • Chinese debt levels will continue to rise quickly over the rest of this year and next. • Chinese growth will begin to slow sharply by 2013-14 and will hit an average of 3% well before the end of the decade. • Any decline in GDP growth will disproportionately affect investment and so the demand for non-food commodities. • If the PBoC resists interest rate cuts as inflation declines, China may even begin slowing in 2012. • Much slower growth in China will not lead to social unrest if China meaningfully rebalances. • Within three years Beijing will be seriously examining large-scale privatization as part of its adjustment policy. • European politics will continue to deteriorate rapidly and the major political parties will either become increasingly radicalized or marginalized. • Spain and several countries, perhaps even Italy (but probably not France) will be forced to leave the euro and restructure their debt with significant debt forgiveness. • Germany will stubbornly (and foolishly) refuse to bear its share of the burden of the European adjustment, and the subsequent retaliation by the deficit countries will cause German growth to drop to zero or negative for many years. • Trade protection sentiment in the US will rise inexorably and unemployment stays high for a few more years. The federal budget is not like a household budget, and it's misguided to try to apply similar austerity measures given the shaky economy. Treasury bond sales: Welfare for the rich! It's been well discussed here as well as in many other MMT blogs on the web, that the government doesn't need to sell bonds. It spends simply by crediting bank accounts and the sale of bonds isn't necessary for the government to have the funds to pay for goods and services. On the contrary, bond sales have historically functioned merely as a tool used to manipulate the level of reserves in the banking system in order to set interest rates. But now that the Fed pays interest on reserves, the sale of bonds is even more unecessary. So why do we keep on doing it? I have no idea. Here's what the government pays out in interest and what it pays out on some other, important spending items. So the government spends 40 times more money paying interest to rich people than it does for food stamps. It spends twice as much paying welfare to rich people as it does to help the unemployed. It gives more than 10 times more to rich people than it does to needy families. It gives about as much to rich people as it spends, in total, on education. However, to spend this kind of money subsidizing the rich when so many people--kids, families, etc--are going hungry or simply desiring an education or needing a helping hand during an economic depression, that is totally immoral, I'm sorry. Welcome to our government, our leadership and our economic reality. 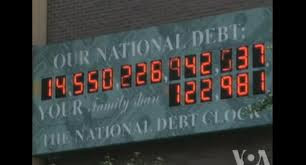 National Debt Clock is really the National Equity Clock! This should be called the National Equity Clock! MMT should raise money to put up an identical electronic billboard right next to this one, but we'll call it the "National Equity Clock," because that's what it really is! Good MMT post on Motley Fool. I am reposting an article that appeared on Motley Fool. There aren't many MMT commentators there. I contributed to Motley Fool back in 2006 and 2007 and wrote a number of MMT related articles. This one is pretty good. I am reposting it here. What would happen if the US Federal Government stopped issuing bonds? But I thought in this post I would highlight the point in the form of a question, so that the answer can be immediately ascertained. First thing to point out is that the issuance of US Federal Government bonds is a Congressional constraint, it is not an operational one. There is a history associated with this, which I delve into detail here and here. I will keep this post concise and leave the statement as a given. If you are unfamiliar with the history surrounding this, read the linked posts. US Government Bond issuance does not 'fund' US Government spending. US Government Tax collection does not 'fund' US Government spending. Currently there is a Congressional constraint that all US Federal Government spending be matched by bond sales (this is a holdover from a convertible currency standard, see above links). Additionally there is a further constraint that this 'debt' (which is a huge misnomer) be capped to some value (the 'debt ceiling'). Both of these constraints have no operational bearing nor curb the ability of the US Government via the US Treasury to credit private sector bank accounts. These are self-imposed constraints, not operational ones. Moreover, the US Federal Government is sovereign issuer of the US Dollar, and as such is monopoly supplier of the currency. It is the source of all US Dollars in existence. It must spend these Dollars into existence before the non-government sector can accumulate them (see links above for more details). It becomes self-evident that the US Federal Government can never not have US Dollars, since it is the sole issuer of the US Dollar. Equally meaningless is the notion that the US Federal government can 'save' US Dollars (that by spending less / saving today will give it the ability to spend more tomorrow). This would be true for all currency users (citizens, companies, US states, etc. ), but this is absolutely false for the currency issuer. The US Federal Government is not a 'super-household' and never has to 'finance' its spending. There is no such thing as a US Federal Government Budget Constraint (GBC). They allow the Federal Reserve to maintain its target short term rate. Deposits within the banking system create reserves. A bank manager has a few options with what to do with those reserves, after using a portion of those reserves to ensure balances are cleared and other maintenance activities, and to maintain reserve requirements (and it is worth noting that many banking systems in other countries have no reserve requirements at all). They could let it sit in the vault as cash (earning no interest). They could keep it on account at the Federal Reserve (which relatively recently now earn a mere 25 bp, they earned 0 for a very long time before that). They could lend the reserves overnight (at an interest premium) on the interbank lending network to banks that require reserves to meet requirements. Or one of the few options beyond that is the purchase of US Government bonds. Reserves are not lent out. With the purchase of the bonds the banks are able to earn more interest in a very liquid asset (the US Treasury market is by far the biggest on the planet). This is how this manifests in the current system: The Federal Reserve has a mandate to maintain short term interest rates consistent with its policy goals. If the banking system has a system-wide deficit of reserves relative to requirements, then competition overnight on the interbank network will drive up the short term interest rate. The Fed reacts to this by buying US Treasury bonds on the open market and prints reserves (out of thin air) in exchange for those bonds. The result is a system wide increase in reserves and a system wide decrease in the amount of US Government bonds (an asset swap). This allows the Fed to put a cap on the short term interest rate relative to its policy goals. On the flip side, If the banking system has an excess amount of reserves relative to requirements, then competition overnight on the interbank network will drive down the short term interest rate. The Fed reacts to this by selling US Treasury bonds from its portfolio on the open market. The banks trade their reserves in exchange for the bonds. The result is a system wide decrease in reserves and a system wide increase in the amount of US Government bonds (again, nothing but an asset swap). Since the Fed is the entity that 'printed' those reserves to begin with, they disappear 'into the ether' when they are returned to the Fed's balance sheet. 7) Net Federal Government spending (spending in excess of taxation) creates net deposits which creates net reserves in the banking system. An increase in reserves pushes down the overnight lending rate. The Federal Reserve maintains control of its target overnight rate by selling US government bonds from its portfolio (via OMO) to ensure demand for reserves (the overnight interest rate) matches its target policy rate. c) Has relevance in the US Monetary System to facilitate liquidity management operations. So what would happen if the US Government stopped issuing bonds tomorrow? From the perspective of the US Federal Government being able to spend .... NOTHING. It would still credit private sector bank accounts at the Federal Reserve (move numbers in a spreadsheet) just like it does today. But it would stop doing the additional step of issuing bonds as it did the crediting. This would mean that reserves would build up in the banking system and competition for reserves would become very small, pushing the overnight rate to zero (just like it is right now with the current level of excess reserves). So basically nothing would happen that isn't already happening in the banking system. In fact, the US Government doesn't have to void all the current bonds. Just stop issuing new ones. The old ones will then expire at maturity and the whole US Government bond system will just gradually go away over the next 3 decades (however the average bond duration held by the non-government sector is something like 6 years so it would lose relevance much sooner in actuality). At sometime in the future, if the Federal Reserve wanted a non-zero Fed Funds Rate, it could just start paying a remuneration rate on all reserves held at the Fed. That would become the new interest rate floor, and the unnecessary song and dance of OMO could be avoided altogether. The Private sector would come up with some new benchmark (instead of the 10 year and 30 year US Treasury bonds) to price longer term loans (corporate loans, mortgages, etc.). The US Federal Government does not need the US Federal Government Bond Market (Primary Dealers, Secondary Dealers, PIMCO, etc.) to provide it with funds, IT IS OTHER WAY AROUND!! All of these political stunts about not raising the debt ceiling are a literal waste of time. All of this analysis about US going the way of Greece (which is a currency *user* of the Euro, not a currency *issuer*) is a waste of time. We have real problems to talk about and to deal with (unemployment, competitiveness, education, etc. ), and we are wasting a great amount of time and energy talking about a non-issue (the debt ceiling, possible US Government 'insolvency', US Bonds rates 'skyrocketing', etc.). I suggest we stop. MV = PY is an identity that means the amount of money (M) multiplied by the turnover of money (V for velocity) is identical to the amount of economic activity (Y) multiplied by the price level (P). MV = PY also appears as MV = PT. Here the T in place of Y stands for transactions. What this says, in effect, is that purchases during a period are equal to sales over the period. Or, since what is spent is someone else's income, income equals expenditure over the period. MV represents money spent, and PY, or PT represents money earned. Give and take are always equal as a matter of accounting. Generally, what is of interest in macroeconomics is Y, since Y is aggregate income (demand) and also aggregate product (supply), that is, Y (national income) equals GDP (gross domestic product). This is written as the identity, Y = C (for household consumption expenditure) + I (for firm capital expenditure) + G (for government fiscal expenditure) + (X - M), signifying net exports, that is, the trade balance. Summing this, national income (aggregate demand) equals national expenditure (aggregate supply). On one hand, monetarists target money supply as the independent variable of economic policy since they view it as the chief means to control firm investment, hence, income leading to demand. For in their view, supply, which comes from investment, creates its own demand, which comes from income, iaw Say's law, in that firm expenditure funds household income. On the other hand, fiscalists target income since income is the basis of effective demand, and in their analysis demand draws forth supply, since firms invest in response to effective demand for their goods. Effective demand sends a signal to firms to invest. Strict monetarists reject fiscalism as ineffective. Fiscalists reject monetarism in a non-convertible floating rate system as inefficient if not also ineffective. New Keynesians accept fiscalism in a so-called liquidity trap but not otherwise. This is the basic kerfuffle going on in many current debates. The basis of the debate between monetarists and fiscalists that is now raging is over whether monetary or fiscal policy is most appropriate, although some economists argue that neither is appropriate and the government should but out and let "the free market" take its course. This is crucial to understanding the debate between MMT and mainstream economists, most of whom are monetarists or have monetarist tendencies. Monetarists are most concerned with M rather than Y, since their focus is inflation. While all economists agree that MV = PY, Milton Friedman used this identity to ground the quantity theory of money (QTM), which explains inflation in terms of change in M, or money supply. QTM holds that increases in M (money supply) imply a corresponding increase in P (price level), i.e., inflation, presuming that V (money turnover or velocity) and Y (product) are constant. For monetarists, M (money supply) is the independent variable in MV = PY, changes in which influence the price level. So, according to monetarists, M needs to be controlled through changes in interest rates, since it is the interest rate channel that affects the relationship of saving and investment as primary determinants of economic activity. The relationship of saving and investment is adjusted through interest rates to encourage investment without provoking inflation. In this view, saving funds investment. The central bank sets interest rates iaw inflationary expectations to adjust the balance of savings and investment, increasing rates to encourage saving when inflationary expectations rise, and lowering them to encourage investment when inflationary expectations are low enough. This view presumes a credit-based monetary system, in which money is borrowed into existence from a central bank that is independent of the Treasury, or from the private sector, instead of being issued directly by the Treasury. This assumes that loanable funds are based on fractional reserve banking and the so-called money multiplier, such that deposits (saving) create reserves that fund loans. By adjusting reserves through monetary operations involving interest rate setting and reserve requirements, the central bank can therefore control the endogenous money supply in this view, and since the Treasury issues debt instruments sold to the private sector in order to obtain reserves needed for fiscal expenditure, it competes for loanable funds to the degree that expenditure exceeds revenue from taxation, thereby "crowding out" private investment. In this view, interest rates are used to target inflation expectation, using unemployment as a tool wrt a rule that is based on a presumption of a natural rate of unemployment defined as "full employment." This creates a buffer stock of unemployed, which implies permanent idle resources. Idle resources are inefficient and wasteful, which economists agree should be avoided if possible. This is admittedly somewhat of an oversimplification since the monetarist position has evolved since Friedman developed it, but it gives the basic idea as a heuristic device. Keynesians dispute QTM. For a Post Keynesian explanation of QTM, see John T. Harvey, Money Growth Does Not Cause Inflation (Forbes, May 14, 2011). For fiscalists, employment is of primary concern. Y (income) is the independent variable in PY = MV, changes in which affect effective demand. So fiscalists hold that Y needs to be controlled through fiscal policy, which affects effective demand. Effective demand draws forth investment to meet profit opportunity, and effective demand is income-dependent, since consumption cannot be funded by drawing down savings, selling assets, or financed by borrowing sustainably. If supply and demand are stabilized at optimal resource use, they unemployment is reduced. The holy grail of macroeconomics is full employment along with price stability, which implies highly efficient use of resources while controlling price level. In the first place, MMT rejects the monetarist explanation virtually in toto, claiming that it is based on an incorrect view of actual operations of the Treasury, central bank, and commercial banking, and how they interact. Secondly, MMT explains how to succeed in the quest for the holy grail through employment of the sectoral balance approach developed by Wynne Godley and functional finance developed by Abba Lerner. The thrust of this approach is to maintain effective demand sufficient for purchase of production (supply) at full employment by offsetting non-government saving desire with the currency issuer's fiscal balance. This stabilizes aggregate demand and aggregate supply at full employment (adjusting aggregate demand wrt changes in population and productivity) without risking inflation arising owing to excessive demand. Note that this does not apply to price level rising due to supply shock, such as an oil crisis provoked by a cartel exerting a monopoly, or shortage of real resources., e.g. due to natural disaster, war, or climate. This is a separate issue and must be addressed differently according to MMT. In a non-convertible floating rate monetary system, the currency issuer is not constrained operationally. The only constraint is real resources. If effective demand outruns the capacity of the economy to expand to meet it, then inflation will result. If effective demand falls short of the capacity of the economy to produce at full employment, then the economy will contract, an output gap open, and unemployment will rise. This view is based on a Treasury-based monetary regime, in which money is created through currency issuance mediated by government fiscal expenditure. Issuance of Treasury securities to offset deficits functions as a reserve drain, which functions as a monetary operation that enables the central bank to hit its target rate rather than being a fiscal operation involving financing. Similarly, taxes are seen not as a funding operation for government expenditure, but as a means to withdraw non-government net financial assets created government expenditure, in order to control effective demand and thereby reduce inflationary pressure as needed iaw the sectoral balance approach and functional finance. This view is quite the opposite of the credit-based monetary presumptions of monetarists, which MMT regards as appropriate to a convertible fixed rate regime like the gold standard but not to the current non-convertible floating rate system that began when President Nixon shut the gold window on August 15, 1971, and was later adopted by most nations, excepting those that pegged their currencies, ran currency boards, or gave up currency sovereignty as did members of the European Monetary Union in adopting the euro as a common currency. It is important to note that MMT economists are NOT recommending the adoption of a Treasury-based monetary system. Rather, they are asserting that the present monetary system is already Treasury-based operationally, even when governments choose to impose political restraints that mimic obsolete practices and create the impression that these are operationally necessary. MMT also recommends an employer assurance program (ELR, JG) to create a buffer stock of employed that the private sector can draw on as needed. This reduces idle resources and presents the possibility of achieving actual full employment (allowing 2% for transitional) along with price stability, which monetarism presumes inflationary. The ELR program also establishes a wage floor as price anchor for price stability. Many quasi-economic arguments — really pseudo-arguments — involving economic policy stem from Alfred Marshall who founded new classical economics on the premise that what classical thinkers had called "political economy" — the study of the socio-economic system including government — was too complex to handle with any precision. Marshall proposed a new methodological approach that he called "economics" as a discipline limiting the scope of its study to rather narrow aspects of the economy capable of being examined with some precision using mathematics and graphs based on partial equilibrium (like the familiar supply and demand curve), and the representative firm. Of course, if this method is scaled to include all firms in aggregate, it commits the fallacy of composition. To his credit Marshall himself realized this danger and cautioned others against. Marshall meant these simple models as aids to thinking about more complex issues, not as models of them. Extending the simple to the complex involves a logical jump, which is an illegal move in the game, owing to the fallacy of composition, for example, and it also involves the fallacy of overgeneralizing. Such sophistical arguments also generally involve straw man arguments designed to make the opposition look foolish. It's just rhetoric made to look like reasoning in order to advance an ideological view under the guise of being "scientific." Arguments that mainstream economists present to the public are often based on this kind of over-simplification and over-extension of the part to the whole. I suppose they would defend what are doing by saying that to communication with lay people they need to oversimplify. But in so doing, they are essentially misrepresenting the conclusions they are presenting, which do not hold at all. I suspect that at least some of them know better, and they are simply couching ideological norms in reasoning that pretends to be that of an expert in economics when is just propagandizing or moralizing. For example, can it coincidental that their line of reasoning always fits their political ideology? But even in their professional work such "experts" are overshadowed by the notion introduced by Marshall that political economy is based on an ineffective method. As result they miss the forest for the trees. Keynes saw through this error and corrected it in his macro approach, the validity of which both neoliberal and Austrian economists deny, since both marginalize the role of government, even though government is necessarily a key component of the economy in a modern developed state. Unfortunately, both neoliberals and New Keynesians seem to miss this point. For example, Brad DeLong is one of the few professors teaching political economy these days and he is quite well informed about the subject. But when it comes to his own practice of economics, even he seems to ignore political economy or minimize it in his popular presentations about economic policy. As a layperson in economics, I find this curious. We need to get back to a contemporary understanding to political economy as a comprehensive socioeconomic approach that includes all relevant factors including government. Does issuance of government securities lower inflation risk? There has been an ongoing debate over whether bond issuance lowers inflation risk. MMT says no. Bill Mitchell addressed this in a recent post, Painstaking, dot-point summary – bond issuance doesn’t lower inflation risk. But guys I think that you are avoiding a main problem of this topic. i.e. Billy’s claim that “bond issuance doesn’t lower inflation risk”. If you agree with this statement do you think that it wouldn't matter if all of US government debt was in the form of monetary base (100% of GDP)? Because it is a straightforward conclusion from Billy’s claim. This is a pretty common objection that comes up wrt the MMT claim that tsys issuance is operationally unnecessary and could be eliminated. If the Fed wished to continue to set a positive overnight rate, then it could simply pay a support rate greater than or equal to the target rate. Otherwise, it could set the overnight federal funds rate to zero. Being operationally unnecessary under the present monetary system, interest on tsys constitutes a subsidy to holders. Does it serve a public purpose? If not, it seems that tys issuance should be eliminated as inefficient. What is the difference between tsys, which are essentially savings accounts at the Fed that pay interest, and reserves that pay interest if there are no tsys and the Fed pays a support rate? The most logical answer seems to be to be that an entity who would have held tsys if they were available — look at who the typical tsys holders are and extrapolate — would seek the nearest substitute or at least the most appropriate risk-weighted return wrt portfolio management in a given context. This is essentially a portfolio management issue. It is actually an issue at present since there are not enough government securities to meet global demand, which is creating demand for more securitization and expanding shadow banking. This would mean that more funds would flow into other savings vehicles (financial investment), some funds would also likely flow into primary investment, and some into commodities and real assets, increasing price levels. There is little reason to expect increased spending on consumption. If some increases in consumption did occur, whether this would be inflationary depends on the employment rate. If all tsys were redeemed immediately, a one-off rise in financial and real asset price level could be expected in adjustment. More likely is that the Treasury would cease issue and redeem existing tsys as they matured, which would largely cover a span of ten years. This would imply a more gradual asset price level adjustment. The optimal solution would be that funds would shift substantially from saving to investment. The problem the world is facing at present is over-saving and under-investment. This is creating a demand for financial innovation, creating new assets classes such as commodities and farmland, and increasing the role of shadow banking and other issues that led to the GFC. The MMT claim is that elimination of tsys would not be inflationary since there is no causal transmission mechanism from increased reserves to increased consumption. But that doesn’t mean that eliminating tsys would not make a difference in portfolio management or the financial markets. Those differences would have to be addressed. "Every system that claims to be scientific is based on a formal system (algorithm). The algorithm is a set of tautologies that say nothing about the world. MMT is a macro theory so it begins with Y = C + I + G + (X-M), and transforms this using rules of formation and transformation into the sectoral balance equation, for instance. The theoretical aspect of the science is the interpretation of the algorithm wrt causality. Macroeconomics needs a microfoundation that reveals the causal mechanisms in terms of individual and group behaviors. This connects the algorithm to reality and enables empirical verification, which is the criterion of truth of hypotheses in science. Explanations and prediction must not only exhibit correlation wrt date, but also be based on a theoretical causal mechanism that explains the why and how underlying observed correlation. This is where it gets tricky. The big difference between MMT and other macro theories is the mechanism and direction of causation. For example, the ISLM model is base on loanable funds and changes in interest rates, which is basic to monetary policy. Supply side macro is based on investment and changes in taxes. Austrian economics is based on the real business cycle and changes in credit. Post Keynesianism is based on effective demand and changes in income and its distribution. MMT is a sub-school of Post Keynesianism that is based on offsetting changing propensity to consume/save from income with vertical (outside) money. Different schools of thought attack each other on this basis. This debate reveals strengths and weaknesses in the respective theories. Through debate, often intense and partisan since economics has a normative component, agreement over “laws” is reached. These laws become the norms of the “normal” paradigm that dominates the scientific universe of discourse and doing “normal” science until enough anomalies arise to warrant a scientific revolution. This is basically the Kuhnian view. Hopefully, we are in the midst of such a revolution. When mainstream economists failed to predict and cannot explain a phenomenon like the global financial crisis, it is evident that something is amiss with the paradigm they are operating in terms of. The normal paradigm in economics is largely the neoclassical (Walrasian) paradigm, with two different schools contending, the monetarist/neoliberal school following Milton Friedman, and the New Keynesian school, following Paul Samuelson, whose goal it was to combine Keynesianism with New Classicalism. Accepting general equilibrium, both schools base their theory on the theoretical concept of “natural rate.” Heterodox schools generally reject this, as did Keynes. These theories as scientific explanations, as well as and their predictions that are often advanced as policy recommendations, are expressed as equations involving dependent and independent variables. Testing is done by applying data (factual) and hypotheses (counterfactual) to these equations using the relevant variables. Of course, empirical testing requires data, but this is not always possible in social and behavioral sciences, including economics, due to practical considerations. Admittedly this is a picture painted with broad brush strokes, but I think it conveys the general idea of formalization in relation to scientific theory and how this relates to economics." One of the things that really appealed to me about Mike's show was how Mike was not content to just simply accept or simply oppose the mainstream economic dogma. Mike would often "wax Philosophic" about not just what market participants were saying, but Mike would often seek to understand why the participants were were saying it. This is uncommon in the media and had a great appeal for me anyways. Tom here investigates and breaks down some views as to economic causation (the "why") from the points of view of the different schools of economic thought. This is a huge, deep, scholarly look into what is going on at a basic, human psychological level in the area of macro economics in and around MMT. For those of us already within the MMT paradigm, understanding the true nature of macroeconomics comes easy to us (it's a gift imo). I'm afraid it does not come that easy to most others, we need to be aware of this. Tom's post here will help us to reach a deeper understanding of where many intellectual opponents of MMT are coming from in their thinking. Dr. Housing Bubble — "The worst housing crash since the Great Depression just got worse"
This is likely to be the first ever global economic disaster caused by real estate sponsored by big banks. During the Great Depression real estate values collapsed as the economy contracted and millions lost their jobs. That is the typical pattern of real estate bubbles bursting. Something in the economy creates a vision of a new paradigm and money starts flowing into real estate as a consequence of this euphoria. This happened in Japan as their economy and stock market frothed over with mania. There is no time in history that the entire world from the U.S. to Canada to Australia to Spain to China suddenly went into a massive trance and believed that real estate suddenly would carry the weight of every single economy forward. Of course what we are seeing is the unraveling of this system. The bubble has burst. Yet the banking system that relied on real estate as their game of choice in the casino cannot come to terms with reality because it would render them insolvent (which they are by the way). So instead, the charade continues yet the public is catching on to this mass deception. What happens when the worst housing crash since the Great Depression gets worse? ECB website reports (finally) that they have recently purchased about E22B of securities under their Securities Markets Program. See Line Item 7.1 in the ECB Balance Sheet here. "The holdings by the Eurosystem of securities held for monetary policy purposes (asset item 7.1) increased by EUR 22.0 billion to EUR 155.7 billion. This increase was due to settled purchases under the Securities Markets Programme. Therefore, in the week ending 12 August 2011 the value of accumulated purchases under the Securities Markets Programme and that of the portfolio held under the covered bond purchase programme totalled EUR 96.0 billion and EUR 59.7 billion respectively. Both portfolios are accounted for on a held-to-maturity basis. (Ed: Must be nice!)" Total purchases under this program were at about a E74B level for quite some time. Now it looks like the ECB has added to its portfolio another E22B in securities. Somewhat related: The Fed has apparently also recently provided $500M to a single European Institution via the USD swap lines. Apparently, systemic external USD liquidity problems can occur at a single institution. Slate — "Fear of a Fed Planet"
"The fact that Rick Perry says something does not necessarily mean that he's wrong, and that the institution has conducted itself in an impeccable way," says James Galbraith, an economist and professor at the University of Texas's Lyndon B. Johnson School of Public Affairs. "The Fed allowed a great overstatement of its powers to become conventional wisdom. It pretended that QE1 and QE2 would achieve something substantial in the economy, when in fact it couldn't." What a joke. As people struggle to pay their bills and put food on their table we allow rich individuals and university endowments to buy oil futures, adding to upward price pressures. Meanwhile, nothing is done. Then, when people demand to know why this is happening, they are given bogus excuses about China and not allowing offshore drilling. "A range of investors were in the market, too. Yale University, Singapore's government, hedge funds Brevan Howard and D.E. Shaw & Co., as well as pension funds for Texas teachers and Danish workers all held positions, according to the list. Also featured were a handful of individuals, including Aubrey McClendon, chief executive of Chesapeake Energy Corp. (CHK - News), one of the nation's largest producers of natural gas. Cascade Investment LLC, the investment arm for Microsoft Corp. (MSFT - News) co-founder Bill Gates, appeared." No, they won’t. There is so much nonsense still being said about this, even by economist[s] who should know better, that I thought I would try to address what it would mean if the PBoC were actually serious and not simply making noises aimed at domestic political constituents. Read the full post, Foreign capital, go home! I ran into David Stockman at Fox yesterday. Several months ago I bumped into him as well and we got into a conversation about the debt. Stockman was Reagan's budget director until he got fired, probably because he protested too much against the huge deficits that Reagan ran (which created an economic boom). After he left the White House he disappeared for quite a long time, but has since resurfaced as the new "debt Cassandra," warning everyone who will listen that the debt is going to bankrupt the country unless we get it under control, yada, yada, yada. The last time I met Stockman I asked him what would happen if we didn't get the debt under control? He said interest rates would spike and it would be impossible for us to service our debt. I said that interest rates wouldn't spike, necessarily, so long as the Fed kept them low and even if rates did go up, the U.S. would have no inability to pay the debt service becuase it was simply a matter of the government crediting bank accounts in U.S. dollars, which it does all the time. He took issue with my assertion that the Fed set the rates. I asked him about Japan, which has a debt almost three times that of the U.S. yet yields on 10-year Japanese gov't bonds were only 1.0%. (Back in March 10-year U.S. Treasury yields were about 3.6%.) He said that Japan was "different" because it was "internally financed" as opposed to our problem of having external finance. When I countered that the U.S. was also "internally financed" because it's all in dollars, he got annoyed and basically walked out in a huff, shaking his head the whole time as if I was some ignorant fool. Well, yesterday, Stockman was on Cavuto and he started in with his usual debt rant--unsustainable debt, bankruptcy, etc. But then he said this: "We should abolish the Fed." Neil Cavuto looked at him and said, "Abolish the Fed? Why?" He said, "Because the Fed is keeping interest rates artificially low and that is bad." I couldn't believe my ears. Just a few months earlier this guy was arguing adamantly that the Fed did not control rates and that rates would spike and we wouldn't be able to pay the debt service. Meanwhile, over that short period of time, deficit spending has continued and the U.S. even had its credit rating dowgraded and interest rates had fallen even further. It was obvious that none of the things he had been predicting were coming true. When he came back to the green room from his segment I said to him, "David, I thought you said in our last discussion tht the Fed didn't control rates and now you just said that it is keeping rates down?" Unbelievable. These are our policymakers. Clueless, arrogant, people who are so full of themselves and so deep into their club of false beliefs that it is mindboggling. If they weren't so destructive these guys would be truly laughable. Warren Mosler critiques Paul Krugman's "MMT, again"
Paul Krugman's post is italicized in block quotes. Warren Mosler responds point by point in caps. Let’s have a more or less concrete example. Suppose that at some future date — a date at which private demand for funds has revived, so that there are lending opportunities — the US government has committed itself to spending equal to 27 percent of GDP, while the tax laws only lead to 17 percent of GDP in revenues. And consider what happens in that case under two scenarios. In the first, investors believe that the government will eventually raise revenue and/or cut spending, and are willing to lend enough to cover the deficit. In the second, for whatever reason, investors refuse to buy US bonds. WHICH, WHEN LOOKING AT GOVT. ON A CONSOLIDATED BASIS- FUNCTIONALLY COMBINING THE TSY AND FED, IS WHAT HAPPENS IN ANY CASE. GOVT. SPENDING ADDS TO MEMBER BANK RESERVE BALANCES, AND TAXING REDUCES THOSE SAME BALANCES. BORROWING SHIFTS THOSE BALANCES FROM RESERVE ACCOUNTS TO SECURITIES ACCOUNTS, BOTH AT THE FED. AND REPAYING BORROWING IS THE SHIFTING OF DOLLARS FROM SECURITIES ACCOUNTS BACK TO RESERVE ACCOUNTS. POINT HERE IS, THE GOVT. (FROM INCEPTION) CAN’T DO WHAT’S CALLED A RESERVE DRAIN (DEBITING RESERVE ACCOUNTS) WITHOUT FIRST DOING A RESERVE ADD (SPENDING OR LENDING). SO UNLESS THE GOVT. ALLOWS BANK OVERDRAFTS- AND AN OVERDRAFT, IS, FUNCTIONALLY, A LOANS TO THAT BANK, AND BOOKED AS SUCH WHEN IT HAPPENS- IT CAN’T TAKE DOLLARS OUT OF MEMBER BANK RESERVE ACCOUNTS WITHOUT FIRST PUTTING THEM IN. AND IN THE CASE OF OVERDRAFTS IN RESERVE ACCOUNTS, THE OVERDRAFT LOAN IS THE GOVT DOING A RESERVE ADD FIRST, AND THEN A RESERVE DRAIN. IT’S LIKE A BUS COMPANY CAN’T COLLECT IT’S TOKENS FOR ANY REASON UNTIL AFTER IT ISSUES THEM. THAT’S THE DIFFERENCE BETWEEN ISSUER AND USER- ISSUERS MUST ISSUE FIRST, AND THEN COLLECT, USERS MUST FIRST COLLECT AND THEN MAKE PAYMENTS. We’re assuming that there are lending opportunities out there, so the banks won’t leave their newly acquired reserves sitting idle; they’ll convert them into currency, which they lend to individuals. IN THE BANKING SYSTEM, THE CAUSATION IS FROM LOANS TO DEPOSITS. LOANS DON’T DIMINISH THE TOTAL RESERVES IN THE BANKING SYSTEM. So the government indeed ends up financing itself by printing money, getting the private sector to accept pieces of green paper in return for goods and services. NOT EXACTLY. IF GOVT SPENDS AND DOESN’T ISSUE SECURITIES, WHICH ARE TIME DEPOSITS IN FED SECURITIES ACCOUNTS, THE DOLLARS INSTEAD SIT IN RESERVE ACCOUNTS. IN ORDER TO SUPPORT THE FED’S TARGET RATE OF INTEREST, THE FED THEN PAYS INTEREST ON THOSE RESERVE BALANCES, OFTEN CALLED THE ‘SUPPORT RATE’, OR THE MARGINAL COST OF FUNDS- THE FED FUNDS RATE- FALLS TO 0%. THE WAY THE GOVT SUPPORTS A NON ZERO RATE TARGET IS TO PAY INTEREST ON THE RESERVE BALANCES CREATED BY DEFICIT SPENDING. IT CAN USE EITHER TSY SECS, WHICH ARE FUNCTIONALLY TIME DEPOSITS AT THE FED, OR INTEREST BEARING RESERVE BALANCES HELD BY MEMBER BANKS AT THE FED. And I think the MMTers agree that this would lead to inflation; I’m not clear on whether they realize that a deficit financed by money issue is more inflationary than a deficit financed by bond issue. WITH TODAY’S FLOATING EXCHANGE RATE POLICY, IT’S PRIMARILY THE ACTUAL SPENDING THAT’S INFLATIONARY, AND NOT SO MUCH THE WAY THE SUPPORT RATE IS PAID- EITHER ON OVERNIGHT BALANCES OR ON TERM DEPOSITS (TREASURY SECURITIES). AS ABOVE. YOUR CONCERN IS FOR FIXED EXCHANGE RATE REGIMES, SUCH AS A GOLD STANDARD, WHERE TREASURY SECURITIES MUST COMPETE WITH THE OPTION TO CONVERT AT THE GOVT. OF ISSUE. AND BY NOT OFFERING TREASURY SECURITIES OR OTHERWISE COMPETING WITH A COMPETITIVE INTEREST RATE, THE HOLDERS OF THE DOLLARS WOULD BE PRONE TO CONVERT THEM AND DRAIN THAT NATION’S RESERVES, WHICH CAN QUICKLY LEAD TO DEVALUATION AND AT LEAST A ONE TIME JUMP IN THE PRICE LEVEL. The point is that there are limits to the amount of real resources that you can extract through seigniorage. When people expect inflation, they become reluctant to hold cash, which drive prices up and means that the government has to print more money to extract a given amount of real resources, which means higher inflation, etc.. I CALL THAT A DROP IN SAVINGS DESIRES. WITH FLOATING EXCHANGE RATES, INFLATION FROM THAT SOURCE IS TAKEN OUT IN THE LEVEL OF THE CURRENCY. AND YES, WITH INFLATION GOVT SPENDING TENDS TO GO UP, HOWEVER SO DO TAX RECEIPTS, AS PER THE SMALL CARTER SURPLUS IN 1979? Do the math, and it becomes clear that any attempt to extract too much from seigniorage — more than a few percent of GDP, probably — leads to an infinite upward spiral in inflation. ALSO, INFLATION IS ALREADY DEFINED AS A CONTINUOUS INCREASE IN THE PRICE LEVEL. MORE OFTEN THAN NOT, I’VE SEEN RATES OF INFLATION STABILIZE AT ELEVATED LEVELS, RATHER THAN ACCELERATE, THOUGH IT’S CERTAINLY POSSIBLE IF PUSHED ENOUGH. I SAY IT THIS WAY- THE RISK OF OVERSPENDING IS INFLATION, NOT SOLVENCY. AND EVEN IN RUSSIA IN 1998, A CLASSIC FIXED EXCHANGE RATE BLOW UP, THE RUBLE WENT FROM 6.45 TO THE DOLLAR TO ABOUT 28 TO THE DOLLAR, WHERE IT’S PRETTY MUCH BEEN EVER SINCE. SAME WITH THE MEXICAN PESO A FEW YEARS BEFORE THAT. IT WENT FROM 3.5 TO ABOUT 10 TO THE DOLLAR AND PRETTY MUCH STABILIZED THERE. BUT ALL I’M SAYING HERE IS THAT CONTINUOUSLY ACCELERATING INFLATION ISN’T NECESSARILY AUTOMATIC, EVEN IN SITUATIONS FAR WORSE THEN ANYONE’S IMAGINING FOR THE US. In effect, the currency is destroyed. This would not happen, even with the same deficit, if the government can still sell bonds. AS ABOVE, IT’S NOT ABOUT BOND SALES PER SE WITH OUR CURRENT INSTITUTIONAL ARRANGEMENTS. RESPECTFULLY DON’T AGREE, AS ABOVE. WITH TODAY’S INSTITUTIONAL STRUCTURE IT’S ENTIRELY A MATTER OF AGGREGATE DEMAND. AGAIN, NOT THE CASE WITH TODAY’S INSTITUTIONAL STRUCTURE. I’VE BEEN AN ‘INSIDER’ IN MONETARY OPERATIONS FOR ALMOST 40 YEARS. I KNOW HOW THE DEBITS AND CREDITS WORK. AND EVERYONE IN FED OPERATIONS WOULD AGREE WITH ME. Congressman Paul Ryan should apologize to the American people! This was posted on Warren Mosler's site. Warren says that Paul Ryan should apologize to the American people for his misleading comments on the debt. Your response to the President Obama’s State of the Union address included something we’ve all heard a lot of ever since. You warned along the lines that that the US could become the next Greece, and be faced with some kind of a sudden financial crisis, where the world would no longer lend to us, interest rates would skyrocket, and the US, unable to spend, would be down on its knees before the IMF begging for the needed funding. And no one with any kind of national public forum took issue with you, including the President and the Democrats in Congress, who for all appearances quietly agreed and acted accordingly. Well, today, based on the near universal response to the S&P downgrade, everyone now knows, or should know, there is no such thing as the US becoming the next Greece. The US is the issuer of the dollar. So it can always make timely payments without limit. THERE IS NO SOLVENCY ISSUE FOR THE US. There is no such thing as the US running out of dollars to spend. There is no such thing as the US being dependent on taxing or borrowing to get dollars to spend. can print dollars. And so they are all indeed dependent on revenues from somewhere to be able to spend. So, Congressman Ryan, please apologize NOW for being so wrong and so misleading. There is no solvency risk for the US. The Fed is price setter for the interest rates for the US government and the banking system, not the market, just like the European Central Bank sets the interest rates for its banking system and its own debt. Congressman Ryan, your reasons for deficit reduction have vaporized. You see, the risk of overspending is inflation, not solvency. So if you want to argue for deficit reduction, apologize NOW, regroup, and come back with your next round of fear mongering about how the deficit can be inflationary, or something like that, and see how that flies. Mish parses the numbers for us. The figures show that the US is still alive and well, in spite of superficial appearances. A comparison of the same data displayed in a variety of ways reveals startling differences in import. Shaun Hingston posted a provocative comment on allocation and equality recently, and I asked him to expand upon it in a post. Here are his thoughts. Allocation efficiency is the ability to effectively allocate resources towards activities that increase one's welfare. If someone has more resources to manage than they did before, will they still allocate those resources with the same efficiency? I think not. As the amount of resources one has increases, so does the number of allocation errors. Therefore one's allocative efficiency falls, as the amount of resources they have increases. Such a statement is intuitive. As the amount of stuff I have grows, the harder it is to keep everything running at the optimal level. Whenever a resource is misallocated, it is no longer producing the optimal amount of income. So, the number of misallocations grows as the amount of resources increases. Assume a second person equally capable, but with less resources than the first, what course of action should be taken to ensure that the income from all the resources is maximised? For a given single resource item, is it more likely to be misallocated by the first or second person? Since misallocation is proportional to the amount of resources one has, the first person is more likely to mis-allocate the resource item. So to minimize the amount of mis-allocations, first person should give some of their resources to the second person. But how much resources should first person give to the second person ? The objective is to maximise the income from resources, which is achieved by correctly allocating resources. The first person should continue to give resources to the second person until each person is equally likely to misallocate resources. Recall that mis-allocation is proportional to the amount of resources each has. So they are equally likely to correctly allocate when they have the same amount of resources. This means that the income from resources will be maximized when person one and two have the same amount of resources. What about for a third person? The rule still holds. That is, the total resources should be divided equally between one, two and three. This will ensure that income from resources will be maximized. This rule will hold for any subsequent person. Therefore a community will achieve maximal income when resources are divided equally, assuming equal allocation ability. So far it is assumed that everyone has the same ability to allocate resources, which isn't true. The assertion doesn't hold when considering different allocation skill levels. Therefore one must consider the cost of education and allocation. Lets consider the above scenario where the first person has more resources than the second person. Let's also assume the second person is less capable than the first person. From the community's perspective the first person can either use her energy to allocate resources or educate the second person. This is a simple profit/loss calculation. Calculate the cost of educating second person and the associated allocative gains, compared with the allocative losses incurred to educate first person. If people were immortal then on average the optimal decision is to educate second person. For society as a whole, this obviously shows that the more time and effort spent on empowering people, the greater that society will be. Society may suffer a short-term fall in allocation efficiency, but it will result in a long-term allocation capacity increase, and consequently income. From the community's perspective undereducated people are an obvious resource. Raising people through education will increase the communityÍs ability to allocate resources. This will lead to an increase in income and consequently prosperity for all. The businessman might argue the teacher should educate him instead of you. This assumes that the businessman is more capable of learning than you are. Indeed this could be true. However, it becomes harder to justify not teaching you as his wealth grows many times greater than yours. The businessman has a huge amount of resources to allocate. So it is significantly more expensive to fund the education of a businessman than you. Allocative errors grow because the businessman is learning instead of allocating, a huge cost considering the amount of resources they must allocate. This huge cost must be justified by a corresponding improvement in allocation efficiency. In addition, the businessman's allocation efficiency increase must be greater than that achieved by educating you. The resources used to educate the businessman could be used to educate you or others. And since you do not have as many resources to allocate, then the time-cost is significantly less. Therefore even if it takes you significantly longer to learn the same topic, it may still be cheaper to educate you, many times over. Thus resulting in the greatest allocative efficiency. The gap between the rich and the poor could be viewed as a way to measure the allocation and learning ability of the rich compared to the poor. A large gap can only be justified if the rich are allocating resources better and can be educated cheaper than everyone else. Given that allocative errors grows as the amount of resources one has increases, and education costs also rise as the amount of resources someone has increases, then today's gap is unlikely to reflect the true capacity each individual has. In fact as the gap grows, the errors will increase, which will detrimentally affect income. As the gap becomes ever greater, income from resources is sub-optimal. Society underperforms without any logical economic reason. Just two days before, during his Saturday radio address, Obama urged Congress approve three trade deals, including one with Panama that would permit Americans to easily stash assets in the Central American country, a notorious tax haven for the wealthy and American corporations. "It’s time Congress finally passed a set of trade deals that would help displaced workers looking for new jobs," Obama said, "and that would allow our businesses to sell more products in countries in Asia and South America -- products stamped with three words: Made in America." But Panama's entire annual economic output is around $26.7 billion a year, according to The World Bank -- only about two-tenths of one percent of the U.S. economy -- making the effect on jobs minuscule at best. Some economists expect other agreements with South Korea and Colombia to create net job losses in the U.S., as corporations ship American jobs overseas to take advantage of cheaper labor. It may not have a large economy, but Panama does have some of the most stringent bank secrecy laws in the world, making it extremely easy and inexpensive for U.S. citizens to set up offshore corporations and bank accounts. Establishing the corporation and bank account costs less than $2,000, and any money that Americans stash in these entities is not taxed. Bank secrecy laws and extremely lax corporate registration standards make it very difficult for the Internal Revenue Service to track transactions transferring funds to these Panamanian destinations from the United States. Small surprise, then, that Panama is home to nearly 400,000 offshore corporations, more than any other nation except Hong Kong. "A tax haven . . . has one of three characteristics: It has no income tax or a very low-rate income tax; it has bank secrecy laws; and it has a history of noncooperation with other countries on exchanging information about tax matters," said Rebecca Wilkins, senior counsel with Citizens for Tax Justice, a nonpartisan nonprofit dedicated to improving U.S. tax policy. "Panama has all three of those. ... They're probably the worst." The trade agreement with Panama would effectively bar the U.S. from cracking down on this activity. The U.S. would not be allowed to treat Panamanian financial services transactions differently from transactions in nations that are not tax havens. It would also be unable to pursue some standard anti-money laundering techniques in Panama. Combating tax haven abuse in Panama would be a violation of the trade agreement, exposing the U.S. to fines from international authorities. "It directly undermines Obama's putative domestic agenda of job creation, cracking down on tax havens and collecting revenue from tax-dodging corporations," said Lori Wallach, Director of Public Citizen's Global Trade Watch. "The [free trade agreement] would forbid future use of existing policy tools to combat financial crime." More corruption for campaign finance contributions. William Galston of the Brookings Institution seems to be a deficit dove, but otherwise good recommendations. The president and Congress must recognize that an AA-plus country, to remain AA-plus, must focus on growth, not debt reduction, in the short term. We have a debt problem — but primarily a crisis of aggregate demand. A 21st-century Keynes would have recognized this and sounded the alarm, pointing out that policymakers from a fiscal perspective are pointing us toward recession and the destructive 1930s instead of a low-growth but still breathing U.S. economy of the 21st century. Ok, he's a deficit dove, but he gets it that "It's the demand, stupid." At least that is an improvement over his recent commets. Seems like he has recovered himself. Why I think things are not as bad as 8 days ago. "Who's gonna buy them now?" It's the population growth, stupid.